It is now officially spring and we can look forward to longer days and warmer weather. Spring time is the beginning of the wasp season, as the the queen wasps come out of hibernation and begin to build their nests. 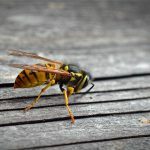 Inevitably wasps nests will be found on properties and can be potentially very dangerous, so it is important to understand and know how to deal with them. 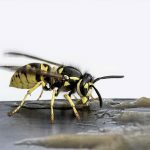 Read on for all you need to know about wasps, from their life cycle to locating a nest and getting them removed from your property. Fertilised queen wasps hibernate over the winter. Wasp nests are not reused each year, so there are no active wasp nests in the Spring. The queens that survive their hibernation wake up as the weather warms and look for a place to build their new nest. At this time the only source of food is nectar from plants and flowers; wasps have a vital role to play in plant pollination just like bees. Once a suitable nest location has been chosen the queen wasp strips wood from fence panels and sheds to use as a building material. The wood is chewed and mixed with saliva to make a paste which is used to construct the nest. She begins by creating a centre stalk called a petiole which she covers in a chemical that repels ants. Around this petiole she then adds cells. The queen lays eggs one by one in the cells within her nest. Once these eggs hatch into larvae she feeds them with protein rich food from insects that she feeds on. These larvae eventually spin a silk cap over the top of their cell, before pupating into an adult wasp, similar to how a caterpillar turns into a butterfly. These adult worker wasps are all female and can sometimes lay eggs, but due to being infertile these can only turn into male wasps which are called drones. By a normal July there are enough worker wasps to take over the duty of nest building, collecting food and feeding the larvae, leaving the queen free to concentrate on egg laying. As the workers feed the larvae on insects the larvae in return offer a small sugar rich droplet for the adults to feed on. The wasp nest continues to grow as the worker wasps collect more material to further build the nest. A queen wasp can lay around 100 eggs per day, a typical nest can be home to over 20,000 wasps. 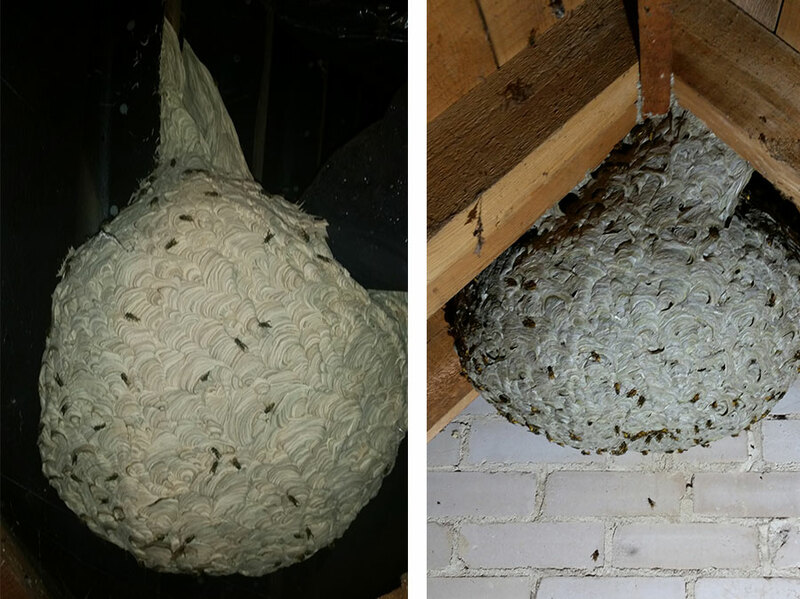 The wasps nest reaches its maximum size towards the end of the summer. At this point the queen lays queen eggs and drone eggs; each nest can produce around 1500 new queens. The original queen wasps work is now done. Once these new eggs have pupated and turned into virgin queens and male drone wasps, they leave the nest and make their way to mating areas. Amazingly nests seem to synchronise to ensure this happens at a similar time. Mixing with wasps from other nests to avoid interbreeding, they mate. As the winter approaches the now fertilised queens find somewhere to hibernate. Around September time and as autumn takes hold the nest has reached it’s maximum size and all of the larvae have pupated. The remaining worker wasps can no longer feed on the sugar solution provided by the larvae. This means they look outside of the nest for food. People often see increased interaction with wasps e.g. in beer gardens towards the end of the summer and autumn as these workers search for sugary foods, plus carbohydrates from foods such as crisps. As winter approaches their food diminishes and all but the new hibernating queens die. As spring emerges, the whole process begins again. 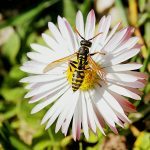 If you are finding there are a lot of wasps in your garden, the first thing is to establish if there are any obvious food sources that they are being attracted to. Large numbers of wasps can make their way from their nests to feed for example on leftover food in bins. Watch the wasps and see if you can establish a pattern of flight. Common places for wasp nests to be located are in roofs and loft spaces, facias, soffits and sheds, so look for signs that wasps are entering and exiting from the same point on your home. Of course, the best way to establish the location of a wasp nest is to call a professional. 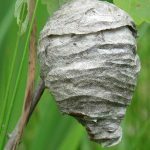 Wasp nests can be very dangerous, with wasps reacting to protect their young and the nest, so it is highly important not to accidentally disturb a nest. In some cases stings can lead to anaphylactic shock which can be potentially life threatening. If you have any reason to believe there may be a wasp nest on your property, call a professional pest controller. At TP Pest Control we offer a no-obligation Free Site Survey, so the first step to getting rid of wasps is to call us out to take a look. We can swiftly establish the source of the problem, locating the nest. Control methods then commonly involve the use of a very fine powdered insecticide that we spray directly into the nest. Where possible we will also remove the nest at the same time. Wasps are amazing creatures and play a valuable role in the garden, through pollination and predation on other insects. In the huge numbers found in a wasp nest however they do pose a threat to humans, and so nests must be dealt with if found on your property. 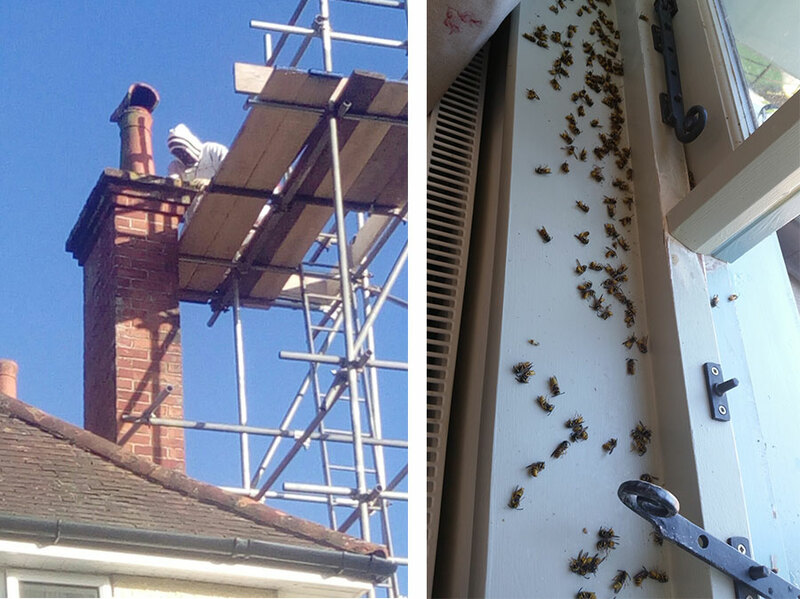 Click to find out more about our wasp control services in Dorset, and call on 07557 880872 or email terry@tppestservices.co.uk for more information or to arrange a free site visit.